A couple of weeks ago, having not gone to the market yet that week, I was trying to figure out what to make for dinner. I didn’t have a lot of food in the fridge and the only vegetable I had was broccoli. Whenever I spend too much time trying to figure out what to make for dinner, dinner usually results in pasta! Well, it is versatile, easy and delicious. Here is the recipe for my Pasta with Cheese and Broccoli. Simple, quick and a crowd pleaser! Try it! Cook the broccoli in boiling salted water. Remove the broccoli from the water using a slotted spoon and set aside. Cook the pasta in the same water until al dente. Drain well and keep warm. While pasta cooks, heat butter in a large saucepan over medium heat. Add the onions and cook for 3 minutes, add the garlic and cook for 1 more minute, stirring occasionally. Add the flour, cumin, paprika, salt and pepper. Stir well. Whisk in milk and raise heat a little to bring to a quick boil. Add the broth , mustard and heavy cream. Simmer sauce to thicken, about 5 minutes. Add the cream cheese and stir well. Add the broccoli , cheddar and parmesan cheese and stir to combine. Drain pasta and add to the sauce. Transfer the pasta to individual baking casseroles and bake for 15 minutes, then turn the oven to broil and cook, 2 to 3 minutes. Serve warm. This looks yummy cheesy, delicious. I must try it. I made a broccoli pasta dish, last night, just with Parmesan and spices and PINE NUTS. They were delicious in the dish. What a delightful pasta dinner & I so love all of the cheeses in here! WOW! Looks so delicious, gonna bookmark this. This looks absolutely fantastic Erica! You did a great job putting this meal together. Sounds delicious and a sure way for my daughter to eat her broccoli! Excellent! I love your béchamel sauce with the broth; my mom used to make it this way and it is delicious; great dish! This looks comforting. I love pasta and almost anything that goes with it. 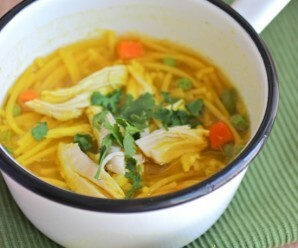 This was a good creation using what ingredients were left in the refrigerator and pantry. I’ve seen a lot of pasta sauces with the addition of cream cheese and have yet to try it. Thanks, now I will. This will be the next pasta recipe I make. Looks so “cheesy”! Do you hear my printer Erica? …this looks sooo good. Rigatoni pasta is one of my favorite shapes. La Gringa- You can use any kind of cheese. 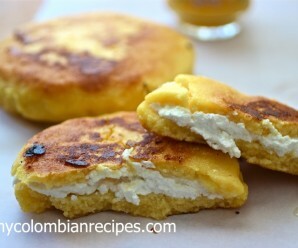 Let me know if you use Colombian cheese 🙂 I would love to try it, too! This looks like such a satisfying and delicious meal, Erica! I love your pretty blue pasta dishes! Erica, I want to raid your ramekin/bakeware cabinet! 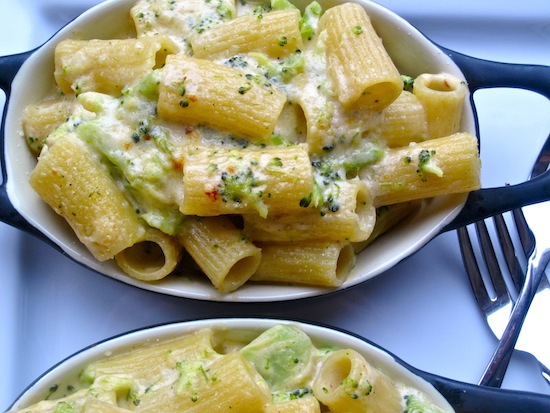 Great looking dish, I love how the cheese clings to the rigatoni. i’m not a broccoli fan, but to be honest, this is the best way to prepare it that i’ve ever seen. 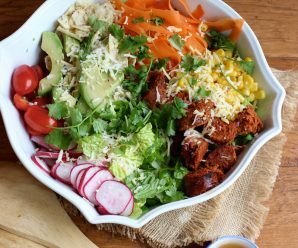 i might actually crave this, which is surprising–great recipe! 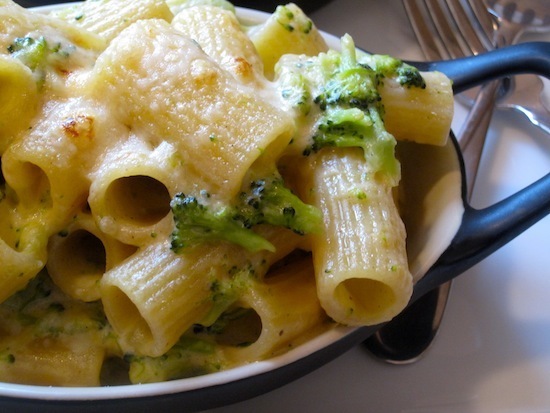 your pasta looks excellent with broccoli and a generous amount of cheese, my family would love it!!! you’ve flavoured it with some mustard and spices too, tempting one!!! 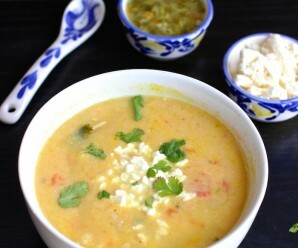 For not having much in your fridge…you did ok…nice and creamy…great dish! I made this one night last week and it was delicious 🙂 The cumin added just the right amount of taste and the crunchy cheese top after broiling was a hit with my kids! Thanks for sharing this recipe. I did this today. Got all the way down the list and forgot the cream cheese. I didn’t with out the cream cheese and it was still good. The Colombian white cheese was good with it Erica.